When French drummer/composer Christian Vander put together the first incarnation of his since-enduring group Magma, releasing Kobaïa (Seventh Records) in 1970, it’s unlikely that he’d have known the musical subculture he was spawning. A unique blend of fusion, neoclassicism, symphonic, and progressive rock, heavily reliant on relentless repetition and chanting in Vander’s created Kobaïan language, Zeuhl has evolved into a musical label, not just attached to Magma’s science fiction-driven universe, but also to Magma-influenced groups from countries including France (Minimum Vital, Shub-Niggurath), Sweden (Simon Steensland), Britain (Guapo), and Japan (Pochakaite Malko). As directionally focused as Magma’s discography is—even as Vander’s vision has grown significantly—Zeuhl has been the catalyst for explorations farther afield, as Hur! 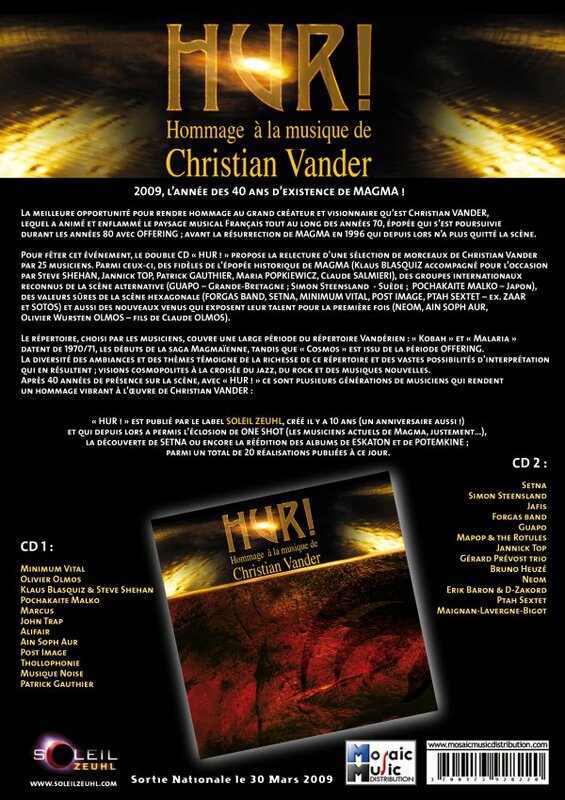 Hommage à la Musique de Christian Vander makes clear. Kobaïan chanting has always been considered an acquired taste—for some, compelling, for others as challenging as Keith Jarrett’s loud vocalizations. Relatively literal takes, like Ptäh Sextet’s version of “Maahnt,” from Attahk (Seventh, 1977), will do little to bring in new Zeuhl fans. That said, some of the all-instrumental tracks, like Forgas Band Phenomena—nominally a Canterbury-centric fusion group with a small but impressive discography including L’Axe du Fou (Cuneiform, 2009)—make Vander’s music more approachable. The repetitive nature of FBP’s take on the propulsive yet episodic “Africa Anteria,” from Magma’s Studio Zünd box set bonus disc Archi? I (Seventh, 2008), links unmistakably to Magma, even as solos from lyrical violinist Karolina Mlodecka’s and unfettered, whammy bar-driven guitarist Benjamin Violet lean further to the fusion side of the complex Zeuhl equation. Minimum Vitale open the 25-song set with a more buoyantly upbeat reading of the title track to Üdü Wüdü (Seventh, 1976), as nylon-string guitar, electric bass, and hand percussion support Kobaïan singing that possesses less of its inherent gravitas. As fine a drummer as he is a composer/conceptualist, Vander’s powerful playing is channeled through drummer Rémi Sanna on Olivier Wursten Olmos’ version of “Kobah,” first heard on the 1976 Live (Utopia, 1976)—much funkier, though, with something indefinable that touches on John McLaughlin’s late-’70s Mahavishnu quartet. Literal though some tracks are, others go to completely unexpected places. Klaus Blasquiz and Steven Shehan’s “Mekajak” is a percussion and chant-driven homage to Magma’s ëkanïk Dëstruktïw Kömmandöh (Seventh, 1973), the final part (but first released) of its classic Theusz Hamtaahk Trilogie. Despite the building blocks of Kobaïan chanting and instrumental repetition, it’s a more creative extrapolation of Zeuhl, as is Pochakaite Malko’s folkloric, all-acoustic version of “Hamtaak,” an obscure Magma track that’s expanded here to include Akihisha Tsuboy’s impressive, virtuosic violin solo. More than any Magma compilation could, Hur! is the perfect entry point for those looking to explore the universe of Zeuhl, as well as a thoroughly creative exploration for the Zeuhl-converted. By ranging from the literal to the unexpected, it demonstrates just how a kernel of an idea can grow into something not just career-defining, but life-consuming. On the occasion of Magma’s 40th anniversary as a band, SZ has assembled this excellent tribute compilation featuring an array of artists, including several former members of the band itself (Jannick Top, Klaus Blasquiz, Patrick Gauthier, etc.) 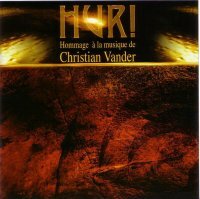 as well as other contemporaries that are influenced to some degree or another by the work of Vander and his band (Patrick Forgas, Simon Steensland, Setna, Guapo, Neom, Gerard Prevost, Erik Baron, Pochakaite Malko, Minimum Vital and many more). Many of these interpretations have surprisingly original arrangements, a couple to the point of near non-recognizability, yet all are respectful and feature outstanding musicianship throughout. Some of the more interesting pieces include Marcus Linon’s “Braveheart (vision de Zess)” where new English lyrics are fused with a remarkably heavy arrangement of one of the band’s best tunes. “Aina” appears twice on disc one, presented once in a more faithful jazz context by Post Image, and again in an unusual streamlined and twisted rock arrangement by John Trap. Klaus Blasquiz and Steve Sheehan’s “Mekajik” seems to fuse some themes from MDK with Asian gongs, Tibetan bells, Indonesian ‘Kecak’ chanting, and unusual percussive treatments – definitely ranks up there in the most unusual category. Setna kicks off the second disc with “Titilbon”, their arrangement of a great unreleased Magma tune from 1977. Guapo offers a completely new instrumental arrangement of “Klaus Kombalad”, suffused with groove and mania. Erik Baron presents “Ementeht Re” in a thoroughly strange and intense arrangement for four basses, four guitars, and multi-percussion, with the guitars assuming the original vocal parts. Disc two ends with a captivating six minute arrangement of “Kohntarkosz” by guitarist Olivier Lavergne, bassist Bruno Maignan and drummer Erick Bigot, with Patrick Gauthier joining in on piano and synths, closing the set nicely in high-energy mode. All taken, this is an outstanding set and a must-have for all fans of Vander’s music.